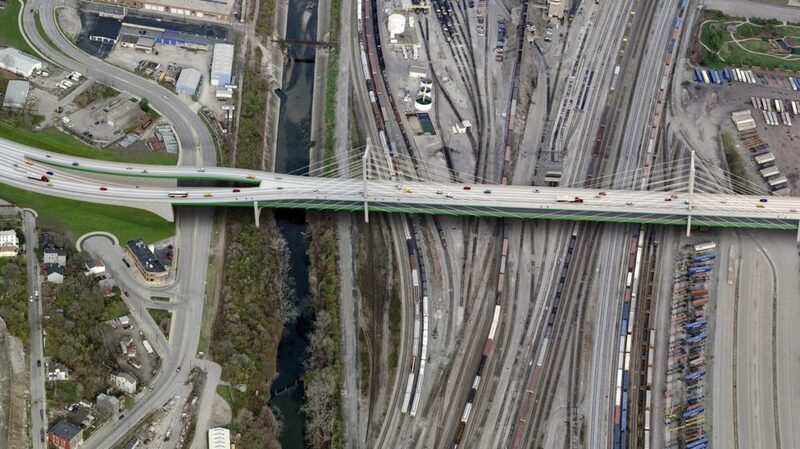 The Western Hills Viaduct, built as part of the Union Terminal project in the early 1930s, is nearing the end of its useful life and will soon need to be replaces at a cost of $300 million. City officials recently unveiled plans for a new Western Hills Viaduct to replace the 84-year-old structure. Built in 1931, the viaduct serves as the West Side’s main connection to the city’s urban core. “It affects everybody,” said Cincinnati City Engineer Richard Szekeresh, the project manager. Over 71,000 vehicles cross the bridge every day. However, a city study back in 2012 highlighted the bridge’s deteriorating structural conditions and the poor pedestrian and bicycle accessibility. The current viaduct is a car haven. Vehicles zoom by a single, narrow sidewalk along the southern edge and cyclists are rare. According to Department of Transportation and Engineering officials, the new structure will be pedestrian- and bicycle-friendly and built to light rail specifications. 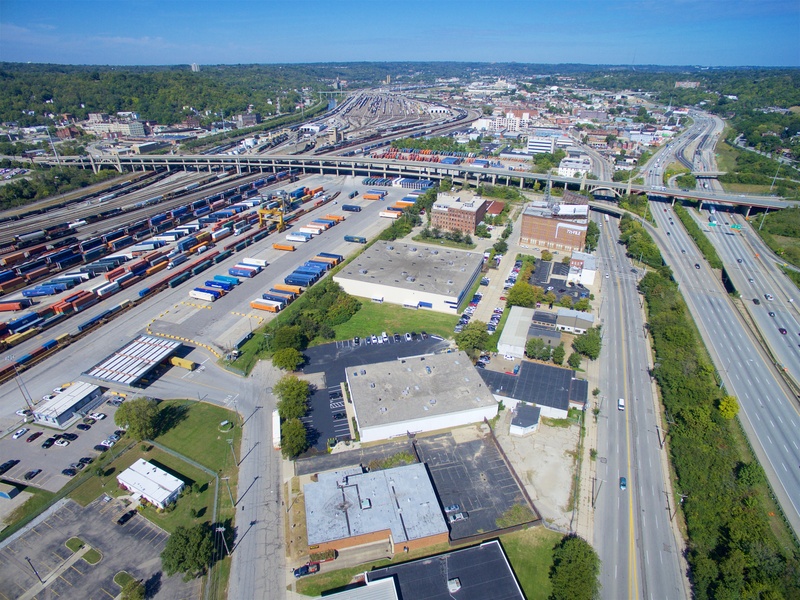 Heading west, the current bridge passes over Interstate 75, the CSX Queensgate rail yard, and then deposits cars onto Queen City Avenue in South Fairmont. Queensgate posed a significant problem for the engineers because they couldn’t shut down a privately-owned and high-trafficked rail yard for several years. “We had to find a way to build only from above,” said Szekeresh. Two design features overcome this constraint. First, the cable-stayed bridge (shown in the renderings) has large distances between its support towers that (mostly) avoid the yard. Second, the physical structure consists of several interlocking parts, meaning the builders can simply insert the relevant pieces into place without much delay. Some rail lines will still be affected, but never for more than a few hours. Traffic concerns ensure the old bridge will remain in use until its replacement is erected just to the south. The Ohio Department of Transportation (ODOT) must acquire several land parcels. All of them have been appraised, but ODOT must complete its environmental review before it can purchase the properties. Total project cost hovers around $310 million, a substantial hike from the city’s previous estimate of $240 million. Federal funds will cover 80 percent, with the city, county, and state covering the remaining funds. Szekeresh indicated that the project could receive a $20 million Transportation Review Advisory Council grant from the Ohio Department of Transportation. When federal funding will arrive, however, is unclear. Extensions to the projected 2028 end date may be necessary, especially if President-elect Trump reneges on his promise to improve infrastructure. After the presentation ended, Szekeresh conducted an informal poll to gauge support for the design. Most community members raised their hands in affirmation.